Courtesy of Clark Campbell, University of Kansas. 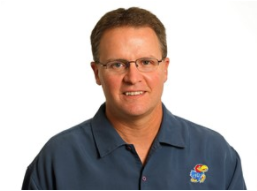 Clark Campbell is the University of Kansas swimming pool and President of the College Swimming and Diving Coaches Association, the oldest coaches association in the USA, founded in 1922. Daily News of Open Water Swimming: Putting together a national championship event is never easy. Can you describe the team that you have around you to host the national collegiate championships? Clark Campbell: It starts with the CSCAA Executive Director, Joel Shinofield. We have the Association’s full support adding an opportunity in our sport. Next, the good folks of Douglas County Parks are absolutely the best. Our venue, Lone Star Lake, is a county property and they take great pride showcasing a true hidden gem in Kansas. Lastly, we have the full support of Kansas Athletics. From Facilities, Sports Med, Communications, etc. everyone is all in on making this a truly special event. Daily News of Open Water Swimming: The event is growing. Do you think that you may have to limit the event in terms of participants at some point in the future? Clark Campbell: We believe the course can accommodate 70 athletes each (men’s and women’s) safely and effectively. Daily News of Open Water Swimming: You were formerly a stud triathlete competing at the highest level, is that were your love of the open water came from - or did you get into open water swimming earlier? Clark Campbell: Triathlon was my first exposure to open water. I was actually better without the walls and found a lot of success; usually in the lead or close to it coming out of the water. Raced during and after my triathlete career in open water events. In fact, I placed first for my age group at the FINA Masters World Championship 5 km in Montreal in the early 1990's. Also, I have passion for endurance sports and it’s my turn getting the next generation excited about the possibilities in those pursuits. Daily News of Open Water Swimming: Can you explain what the teams do when they get to Kansas? How many days ahead of time do they arrive? Where do they stay? Are there any social events for the teams or meetings among the coaches? Clark Campbell: Teams usually arrive two days before. The day before we have the course open in the morning for a swim or simply see the course lay-out. In the afternoon, we make our pools available for team training. A technical meeting is held at 5 pm the day prior which acts as a social gathering. The teams stay at local hotels. Daily News of Open Water Swimming: Where do you foresee this event going in 5 years, in 10 years, in 25 years? Clark Campbell: Short term — Let’s fill the race to 70 athletes on both sides. Mid term — 3 different championships at the NCAA Division I, NCAA Division II and NCAA Division III, all at different sites. Long term - full NCAA sponsorship. * For additional articles on the event, read Bryn Hadley, Kansas Both Win Collegiate Titles, From Lima To Lone Star, Gustavo Gutierrez Shines, Jayhawks To Defend American College Open Water Title, and Stanislas Raczynski Back To Defend Collegiate Title.